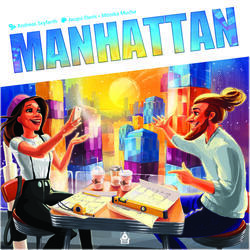 Rewarded with the precious Spiel des Jahres prize in 1994, Manhattan is a highly tactical game where anticipation and opportunism are precious project owners. Become the occupant of the highest penthouse in the city, have the most buildings in the neighborhood and buy the highest apartments to own the most buildings in the city! To build your real estate stock, select at the beginning of the run the buildings you want to build, according to their heights, in your stock. Then choose the area to invest in via one of the four building permits you have been granted, and move on to one of the six areas. If you are building a building started by someone else, you will need to build at least an equal number of floors. Then get a building permit and observe your opponents' placements. When building your buildings, don't forget to take advantage of opportunities to stand out from the crowd! At the end of each round, you get a bonus if you own the top floor of the highest skyscraper, if you own most of the buildings in a neighbourhood or if you occupy a maximum of top floors throughout the city. At the end of the game, the total points collected will designate the most informed investor!